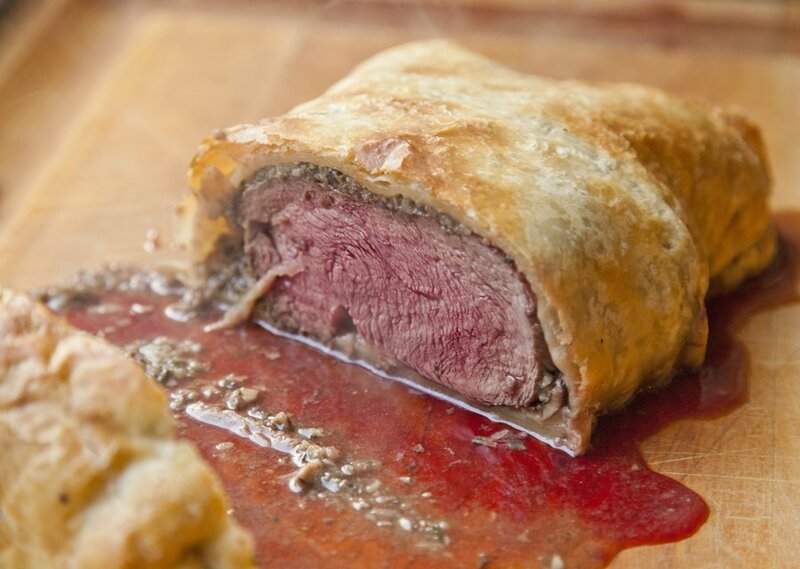 Beef Wellington is a dish that is rated under the “top 10 hardest dishes to make”, at number 4. One of the hardest parts of this dish is cooking the meat correctly, and not over cooking it. 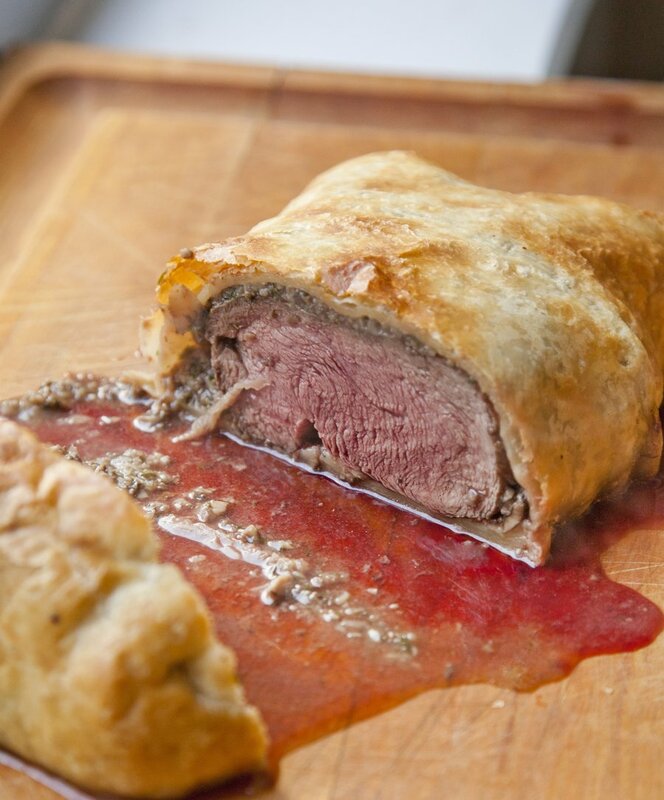 Typically a beef wellington’s tenderloin should be at a medium rare – which is not always an easy feat to achieve. The other hard part about making this dish perfectly, is making the mushroom duxelle so that it doesn’t wind up making your puff pastry soggy during the cooking process. Well last night, I attempted to make this wellington to the best of my abilities and it actually came out pretty close to perfect. My only issue was that the bottom of the puff pastry wound up getting a little soggy, but I don’t know if that was from the mushroom duxelle or from the beef’s juices when cutting it. Either way, the flavors were amazing – the real star of the show, was the sage! This is a great dish to experiment with if you’re in the mood to challenge yourself! Heat up a medium sized saute pan with 1 teaspoon of Olive Oil. Once hot, add in your mushrooms and onion and cook over a medium heat for about 20 minutes - stirring frequently. Add in your garlic, sage and thyme and cook another 2 minutes. Remove from heat, add in parsley, salt and pepper, and place all contents of the saute pan in a sieve to drain out all the liquid. Place the solids in a food processor and pulse about 8-10 times. Reserve. Next in a metal saute pan, heat up enough canola oil to lightly coat the bottom of the pan. Heat til almost smoking - season your beef tenderloin generously with salt and pepper on all sides. Sear the tenderloin on all sides until it's a nice golden brown. Remove tenderloin from the saute pan and allow to rest for 5 minutes. Once it has rested, remove the butcher's twine. 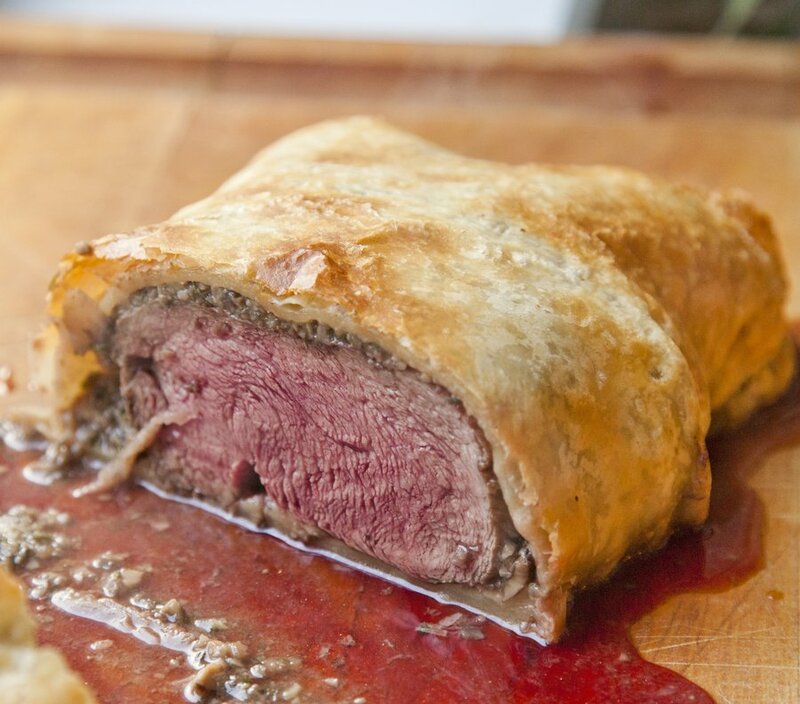 While the beef is resting, roll out your puff pastry to a large rectangle (large enough that you can wrap it around your beef tenderloin and cover it completely. Spread the mushroom mixture (duxelle) all over the puff pastry, leaving a 1.5 inch border clean. 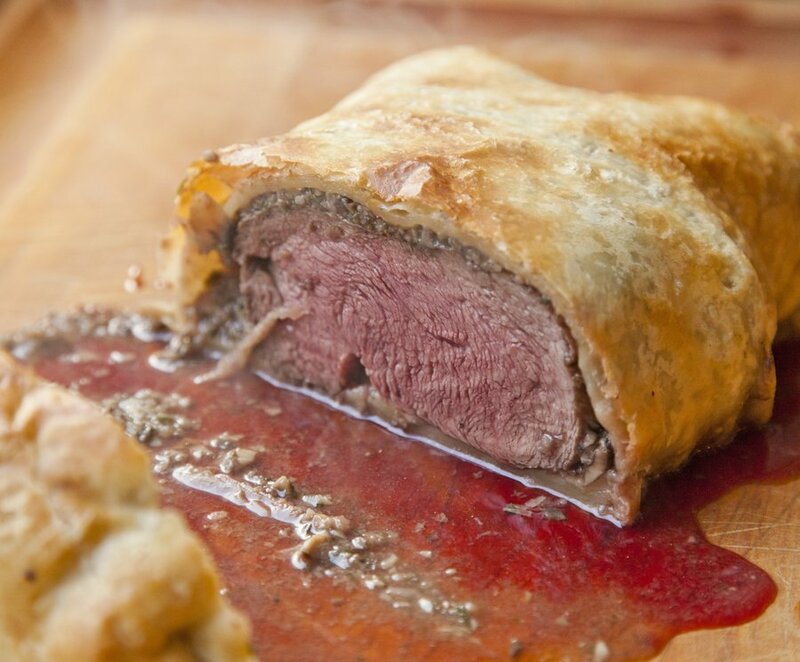 Place the tenderloin in the center of the puff pastry and carefully enclose the pastry around it. Seal the edges with your fingers by pressing it together. Preheat your oven to 400 degrees. 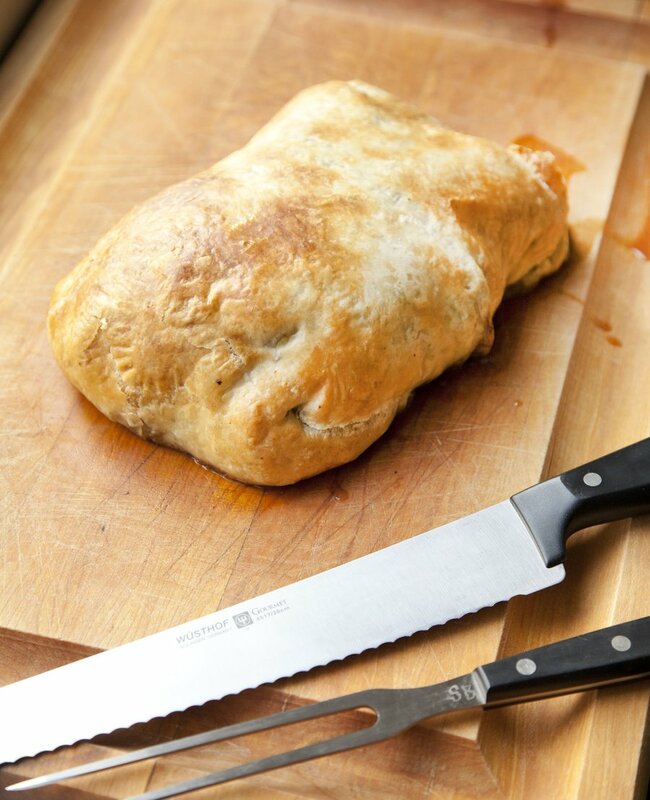 Place the puff pastry on a silpat-lined baking sheet with the seam side down. Bake in the oven for 30 minutes. Remove and allow to rest for about 10 minutes before serving.